In “Poetic Laws,” I provide a fresh look at the legislation in Parashat Kedoshim (Leviticus 19:1—20:27). I examine what can be gained by studying the laws as poetic instead of as prose, proposing several (I hope) significant new readings. In “Korah’s Poetic Rebellion and God’s Flowery Response,” I give a new analysis of compositional layers in Parashat Korach (Numbers 16:1—18:32), suggesting that God originally responded to Korah’s rebellion with patience and beauty—until someone changed the ending. I hope you will take a look! In this blog entry, I am posting a whole year’s worth of links to the online popular articles I have found most interesting recently, with a short block quote to pique your interest. “Why No Truly Ancient Bible Writings Have Been Found,” Philippe Bohstrom, Haaretz, April 26, 2016. The oldest Hebrew manuscripts discovered to date are the Dead Sea Scrolls. Some of the scrolls date back to the 2nd and 3rd centuries B.C.E., well into the Second Temple period. A few earlier Hebraic inscriptions, mainly on stone and pottery shards, have been found, but no extensive manuscripts have survived. Yet many scholars are convinced that at least parts of the Bible had been written down hundreds of years earlier, by the 8th or 7th century B.C.E. — or even earlier. We just don’t have any evidence because of the medium the ancient scribes used. The material upon which books were copied at the time, mainly papyrus and leather parchment, is perishable, and particularly sensitive to the humid climate in the Jerusalem area. That any fragments of biblical manuscripts from antiquity survived at all is remarkable, especially when you think of what happened to the writings of other civilizations. “40 Maps That Explain the Middle East,” Max Fisher, vox.com, March 25, 2015. Maps can be a powerful tool for understanding the world, particularly the Middle East, a place in many ways shaped by changing political borders and demographics. Here are 40 maps crucial for understanding the Middle East — its history, its present, and some of the most important stories in the region today. “Could Our Ancestors See Blue? Ancient people didn’t perceive the colour because they didn’t have a word for it, say scientists,” Ellie Zolfagharifard, Daily Mail, March 2, 2015. “Can You Buy Genuine Antiques in Israel?,” Marty Friedlander, Haaretz, January 12, 2015. Israel is awash in ruins and plenty of tourists want to take a piece of history home – and they can, sometimes for little more than a history textbook would cost. There are plenty of authorized shops throughout Israel where antiquities are sold. Usually you can be relatively certain that the artifact is genuine, and that it is what the seller says it is. But don’t be surprised if he turns coy on details. “On the Half of the World That Doesn’t Make Out,” William Jankowiak, Shelly Volsche, and Justin R. Garcia, sapiens.org, February 10, 2016. Surprisingly few societies have romantic kissing in their repertoire. “Western Wall wearing away? 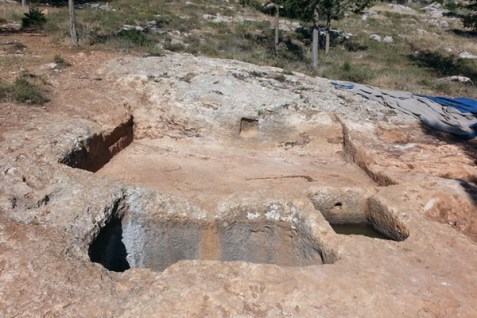 Discovery of extreme erosion process could guide new preservation techniques,” The Hebrew University of Jerusalem, ScienceDaily, August 11, 2014. Researchers have investigated erosion in the different kinds of limestone in the Western Wall at the foot of Jerusalem’s Temple Mount. Stones made up of large crystals were almost unchanged in 2000 years, while limestone with small crystals eroded much faster and in some places had receded by tens of centimeters, potentially weakening the wall’s structure. The researchers describe an accelerated erosion process that explains why some rocks are more weathered than others, and showed that chemo-mechanical erosion extends down to the tiny micron scale. 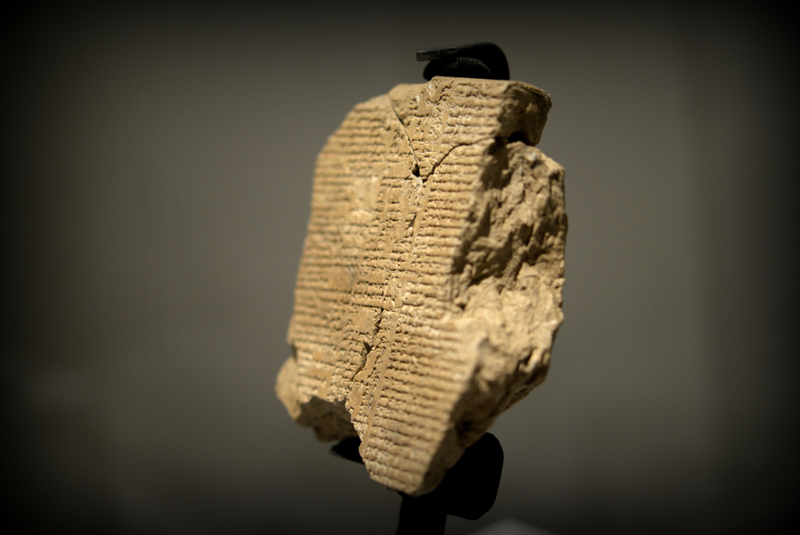 A new fragment of The Epic of Gilgamesh tablet V—incredibly enough, preserving previously unknown lines—has come to light at Sulaymaniyah Museum in Iraq. Read Osama S. M. Amin’s fascinating article about the find. A newly discovered tablet V of the epic of Gilgamesh. The left half of the whole tablet has survived and is composed of 3 fragments. The Sulaymaniyah Museum, Iraq. Photo © Osama S.M. Amin. Click here to download a .pdf of Farouk N H Al-Rawi and Andrew George, “Back to the Cedar Forest: The beginning and end of Tablet V of the Standard Babylonian Epic of Gilgameš,” Journal of Cuneiform Studies 66 (2014): 69-90. I used to dig for dinosaur bones in my backyard in Albuquerque, NM, but I never seemed to find any. Kids growing up in Jerusalem might be slightly more lucky! A 1,400 Year-Old Wine Press Mysteriously Appears in Jerusalem . I encourage everyone to spend a while perusing Bible Odyssey, a new multimedia website for general audiences, created by the Society of Biblical Literature with support from the National Endowment for the Humanities. Launched in 2014, it widely shares the research of scholars of the Bible. The site invites anyone – serious student of the Bible or complete novice – to discover the history, culture, and literature of the Bible, guided by SBL members. As you see in the screencap above, one of the coolest features is the “Ask a Scholar” section, where you can pose any question about the Bible or the ancient Near East and receive a reliable answer from a qualified scholar. This website is an important new resource, with lots of videos, texts, and tools for study. In 2011, the Center for the Study of Religion and American Culture began an interdisciplinary study of the Bible in American life. We are particularly interested in how people use the Bible in their personal daily lives and how other influences, including religious communities and the Internet, shape individuals’ use of scripture. Employing both quantitative methods (the General Social Survey and the National Congregations Study) and qualitative research (historical studies for context), we hope to provide an unprecedented perspective on the Bible’s role outside of worship, in the lived religion of a broad cross-section of Americans. Such data will help scholars seeking to understand changes in American Christianity. The study will also be invaluable to clergy and seminary professors seeking more effective ways to preach and teach about the Bible in an age saturated with information and technology. Dr. Mark S. Smith, the Skirball Professor of Bible and Ancient Near Eastern Studies at New York University, has published an insightful posting about The State of Biblical and Ancient Near Eastern Studies in America. He is writing for The Ancient Near East Today, hosted by ASOR. I obviously have strong opinions about what he says, but not the kind I’d like to post online! The New York Times has an interesting article about camels in the ancient Near East. It’s well worth a read. There are too many camels in the Bible, out of time and out of place. Camels probably had little or no role in the lives of such early Jewish patriarchs as Abraham, Jacob and Joseph, who lived in the first half of the second millennium B.C., and yet stories about them mention these domesticated pack animals more than 20 times. Genesis 24, for example, tells of Abraham’s servant going by camel on a mission to find a wife for Isaac. What the camels in Genesis reveal, in fact, has nothing to do with the “truth” of the biblical story at all. Instead, the presence of these camels in the story highlights, in a very clear way, the essential humanity of the biblical writers: like the best authors, they simply wrote about what they knew. This article from the Washington Post is a good reminder that the conflict between Cain and Abel, which pitted a settled farmer against a nomadic shepherd, is as old as humanity itself! Analysis of pollen grains from sediment beneath the Sea of Galilee and the western shore of the Dead Sea indicate drought caused a Late Bronze Age collapse.